Laugh often, be funnyIt is easy to say then to do it, Me, I often try to laugh about myself. It is hard to be funny I know, but it doesn't requier much. Just some irony or sarcasme and you probably are going to make them laugh. People who make someone laugh are mostly much more likeable. To be funny means to smile too. You know when to make a joke and when not. You have to know when to say something and when you have to shut up. Sometimes it is better to say nothing then to talk like a river. Have similar friendsYes, if you haven't any friends you can't have similar ones. With that I mean that if you see him/her hangin up with someone, you can go and just say hello once, twice and then ask something else. If you are friends with his friends, it is much easier to become likeable to others. The chance that others are going to like you is higher when you have similar friends. Stay as you are, dont change yourselfThey have to like you, not the fake one. Of course you have to lie at some things which are private and shouldn't be spread. make complimentsPeople are going to like you if you are genius and honest. If you like something he is doing or wearing you can tell him/her. With that the person is going to make you a compliment as well. You don't seek attention. You tell them the truth. You should be careful not telling to many compliments, because then it seems as you don't mean it. help him or her out / be there for themThey will remember you when you help them. If you do that they are going to remeber your action and will sometime later do the same thing. It needs time. search for similaritiesIf you have something in commen, you first of all have a bigger chance to become friends. If you are a huge fan of football, you are getting heared, because you know about what you are talking. What you have to do, is to listen and to accept mistakes. 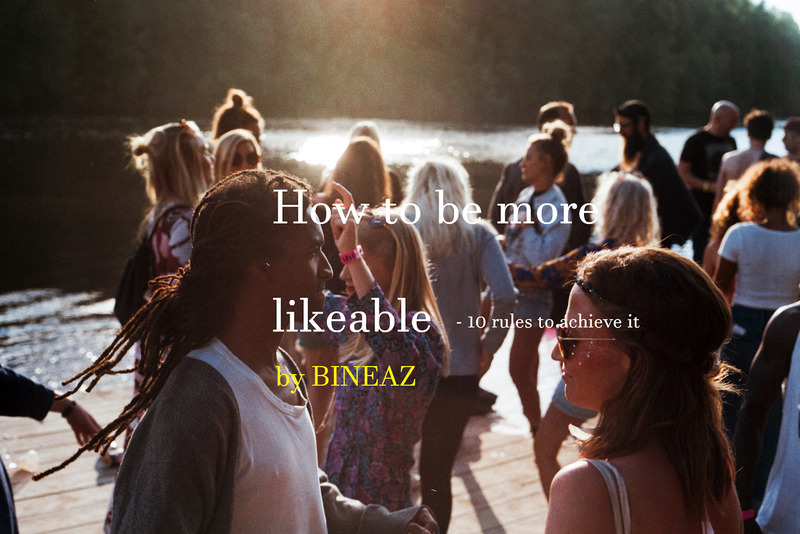 That's what likeable people are doing. Do you like the same artist or songs? give them something to eatFood makes you likeable. Gifts make you beloved. Do not spend to much money. DIY is more liked then something bought. It doesn't have to be something big. go out with themYes. Ask and they are going to let you go with them out. 65%. If you are there and enjoy the night or day, follow the numbers 1-7. Buy them something but don't e to generous. be agood listenerIf they are talking and you listen and remember, they are going to like you much more. You care and help, that's what most people want to. You have to put your phone away and ask question. Do not look at your phone. use positive body languageTouch them when the time is right. Talk in the right pitch. Make the right gestures. Eye contact is important. Use your arms and legs. Sit correctly. Don't close yourself. Bineaz is not my real name. And yes, there are some pics out there with my face on it, but still, I don't like to be so public with my life. I'm 18 years old and I do enjoy writing and telling other people about my storys every Saturday (see shedule). My english isn't that good, thats why I'm writing. (I'm working on it) I love talking about mode, technology, marketing or just about something that happened to me and occupies me. If you like my post and my Blog, a comment would be appreciated or just a follow on Twitter or on Tumblr.